We had an astonishing display of dolphins last night. While sat carrying out a couple of measurements with the CTD for the iron work, lots of small fish had been attracted to the ship probably because of the deck lights. 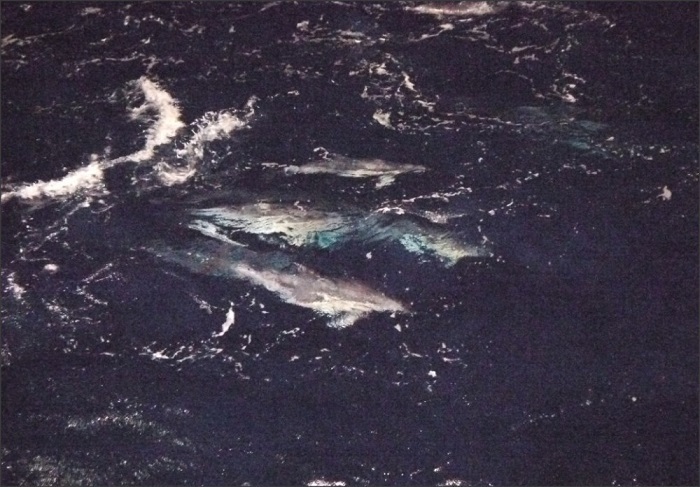 They in turn attracted something like 40-50 dolphins, cruising up and down the ship, accelerating to chase fish, and leaping out of the water to catch fish that were trying to escape. The acceleration and the rate at which the dolphins could turn through 180 degrees were incredible to watch. [A good question for the Oceans Sciences and Marine Biology students back at Liverpool University – the dolphins were reaching easily 10 metres per second, what Reynolds number were they operating at?] With the light from the ship we could see the dolphins 2 or 3 metres below the surface, streaking along after their food. Two sharks also turned up for the feast – much more sedate than the dolphins, cruising slowly into the foray and just wandering about as the dolphins flashed around them. We got a good look at one of them as it passed right below us at the side of the ship – at least 2 metres long. Dolphins and sharks paid each other no attention at all. This whole theatre lasted a good 90 minutes. My camera wasn’t quite up to the task of night-time photography, but the best effort is below. A glorious morning for us today. The wave height has dropped below 3 metres for the first time this trip. 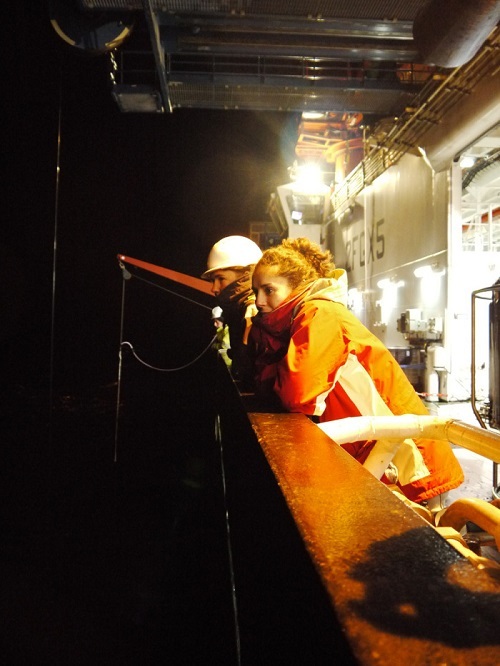 We have now started our 3 day stint at the station at the shelf edge.